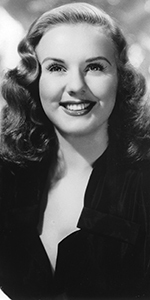 Deanna Durbin was a young singer / actress, who as a very young girl signed a contract with Universal, and made quite a number of popular musicals. Her desire for better material brought her into conflict with the Hollywood methods of the time. She retired from the screen in 1949 at the age of 28. Born to English parents, the Durbins moved to Southern California, where young Edna showed such promise as a singer, that at age ten, she had become the star pupil at the Ralph Thomas Academy. How Durbin was recruited by the Hollywood studios has grown to legenday status, but the facts seem to be that Metro-Goldwyn-Mayer was planning on making a film of the life of opera star Ernestine Schumann-Heink — the production was looking for a young singer who could play the lyric-soprano as a girl. A call to the Thomas Academy brought Durbin to the attention of the M-G-M brass, who were stunned at the mature quality of Durbin's voice. She was signed to a six-month contract. Her first project for the studio, the charming short film Every Sunday (released in November, 1936) paired her with another young singer, Judy Garland. It seems that although M-G-M wanted to keep both singers under contract; Durbin's contract had run out before M-G-M renewed it, so she signed with Universal, who changed her first name to Deanna. Durbin's first film for Universal, Three Smart Girls (December, 1936), was shot when she was only fourteen. She was top-billed over her co-stars Binnie Barnes, Alice Brady and Ray Milland. At the time, Universal Pictures was in turmoil, with a new regime purchasing the debt-ridden studio from Carl Laemmle. Three Smart Girls went a long way toward bringing the studio into more stable financial condition. And so, Deanna Durbin became a very busy young lady. In a whirlwind, she next starred in One Hundred Men and a Girl (released in September, 1937). Universal was set to release Mad About Music (released in February, 1938) when she was enshrined in the Chinese Theatre Forecourt. Durbin later described this time in her life and a continuous flow of rehearsals, filming, and radio sessions (she had a radio program with Eddie Cantor until she was forced to give it up due to scheduling problems). Studio vocal coach Andres de Segurola wanted to get Durbin to play the Metropolitan Opera in New York, but Universal wouldn't hear of it. Make more films she did — That Certain Age (released in October, 1938), Three Smart Girls Grow Up (released in March, 1939) and First Love (released in November, 1939). In February of 1939, she was presented with a "Juvenile" Oscar, along with Mickey Rooney. Durbin cranked out more films: It's a Date (released in March, 1940), Spring Parade (released in September, 1940), Nice Girl? (released in February, 1941), and It Started with Eve (released in September, 1941). When Universal wanted Durbin to do a third Three Smart Girls film, the singer baulked and demanded changes; Universal had to accept her demands and release the result, Hers to Hold (released in July, 1943). She appeared in quasi-musical roles in The Amazing Mrs. Holiday (released in February, 1943), Christmas Holiday (which played the Chinese in June, 1944), and the non-musical Lady on a Train (which played in September, 1945). But Durbin's fans wanted her in light musical comedies, so she returned to the form with Can't Help Singing (released in December, 1944); when Universal became Universal-International in 1946, the Durbin program was retained. I'll Be Yours (released in February, 1947), Something in the Wind (released in July, 1947), Up in Central Park (released in July, 1948), and the comedy For the Love of Mary (released in September, 1948) followed. She got into a legal battle with her studio over who owed what to whom, which was settled out of court; Durbin retired from the screen. In 1950, she married her Lady on a Train director, Chales David, with whom she had two children and raised a son from a previous marriage. Despite being courted to play Eliza Doolittle in My Fair Lady, Durbin refused, declaring that she hated show business, and that "Deanna Durbin" was a person who no longer existed. Edma Mae lived out the rest of her years in almost total seclusion, dying of undisclosed causes at the age of 91. Grauman's Chinese Theatre, Hollywood, California. 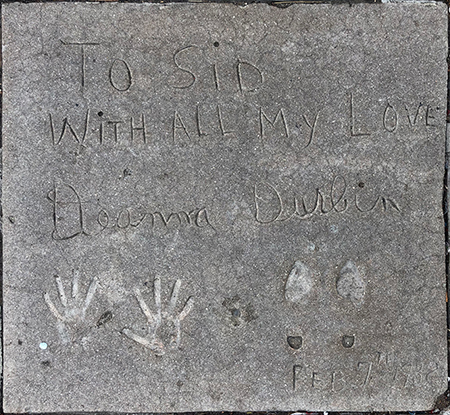 Deanna Durbin Forecourt ceremony, Monday, February 7, 1938. 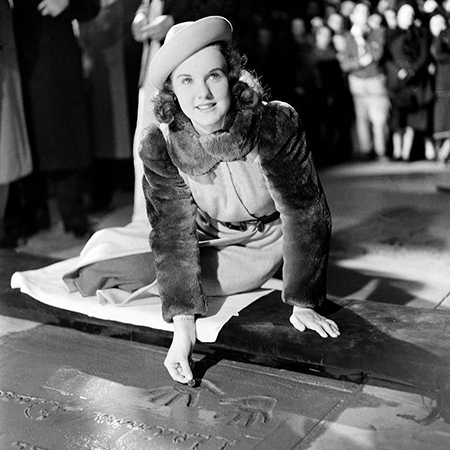 Deanna Durbin displays a lucky penny she will insert into the cement before doing her footprints. The penny has been missing for many years.